Starbucks is at it again. And I love it! On May 6, people throughout New England will be able to vote for a blend that will be renamed for our region of the country. I’m really worried that some mamsy-pamsy light roast may be named for our region. 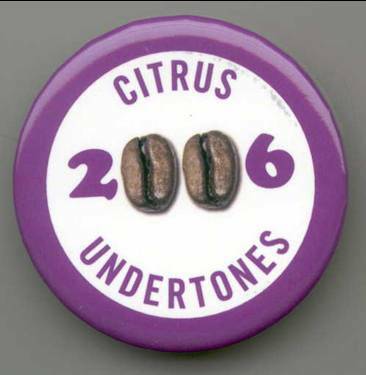 So I’m lobbying for my candidate with this pin. I figure the light roasts can stay at Dunkin Donuts. Posted on April 20, 2006 March 30, 2007 Author Marc A. PitmanCategories coffee & beer5 Comments on Who are you going to vote for? …honestly! See, I’ve taken a picture of it. I can’t find it on the Starbucks website but I’m definitely finding it in the store. You may think my earlier post about the delights of Fortymile Blend passing over your tastebuds was a bit over-the-top. It’s not. If you see it offered at a store, do yourself a favor and give it a try. Your tastebuds will sing your praises! 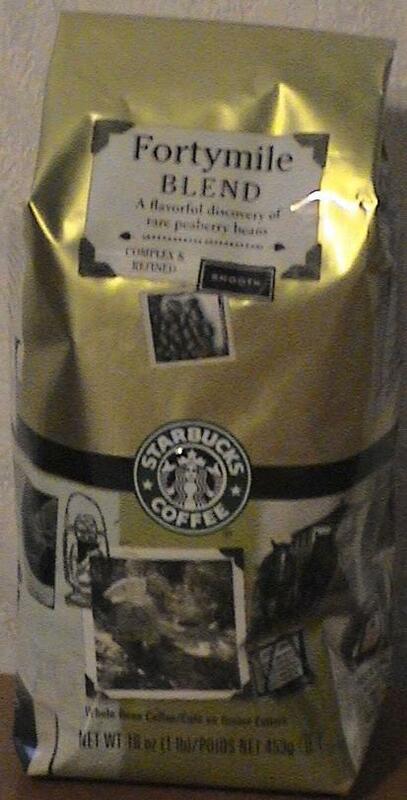 I’ve just had another amazing cup of coffee from Starbucks: Forty Mile Blend. This blend is made exclusively of peaberrys–the name given to the coffee cherries that only develop one bean. Instead of the normal flat sided beans, peaberrys are rounded on both sides. Some say this adds a different taste profile. The story behind the blend’s name is that finding these peaberries is as difficult as panning for gold. So they named it after a famous gold panning river. The taste was bright and palate cleansing. But the most enjoyable, and surprising, elemenet was the way the taste slowly expanded to fill your mouth. The closest I can come to describing it is thinking of listening to a beautiful concerto on a low volume and then slowly increasing the volume. It never got overbearing. But all the complex sensations were never threatened. They just got “bigger” as you savored each swallow. I know, this sounds corny. But try a cup before you mock me. You’ll have to buy your own; I’ve finished my supply! Last week at the Vineyard USA National Leaders’ Conference in Columbus, I happily stumbled across two incredible blends of Starbucks coffee: Komodo Dragon and Arabian Mocha Timor. The Komodo Dragon has all the wonderfully spicy tastes of a great Indonesian. It practically reverberates across your taste buds like the clapper in a bell keeps making noise even after the bell stops moving. The Arabian Mocha Timor has an incredible lively wine-like taste profile. It justs dances over your tongue! The conference was awesome. To hear free audio from the conference, go to this page on the Vineyard USA. Be sure to listen to the two sessions by Bert Waggoner. You’ll want to listen to them a few times. I believe we serve the Supreme story teller. In that context, check out this blog by Seth Godin, The doily lie. What little touches can we add in our services (and lives?) to enhance the telling of the story?